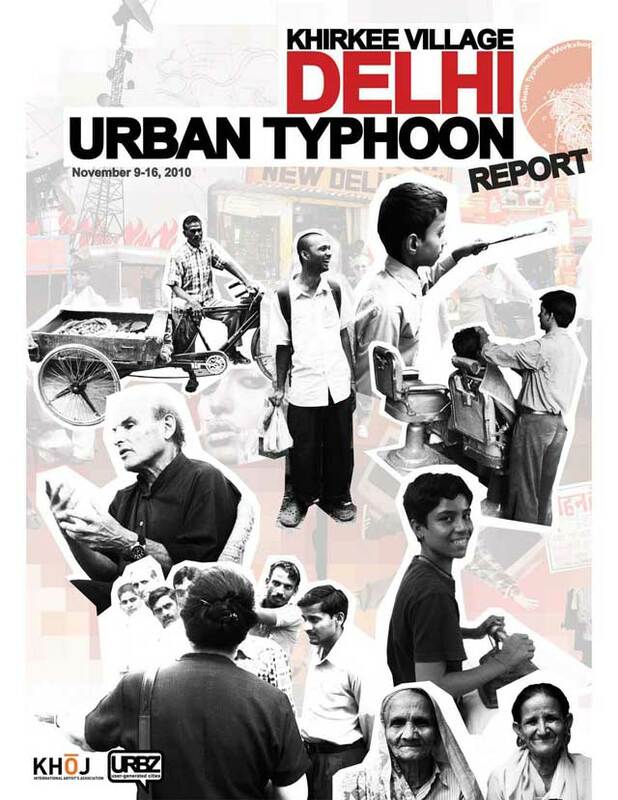 Urban Typhoon, Khirkee, New Delhi, was held between November 9 to 16, 2010. This was the 3rd edition of the Urban Typhoon, organized by URBZ in partnership with KHOJ. For the URBZ Team, and for all the participants this is a moment to celebrate and reflect. The focus of each Urban Typhoon is the bringing together of local residents with invited participants – who are interested in the particular neighbourhood – to brainstorm collectively and produce new projections, alternative visions, ideas and solutions for the neighbourhood. The Urban Typhoon can only happen when the practitioners are invited by residents or groups active in a neighbourhood. They are usually connected to a cause or issue that the residents are trying to solve. In Shimokitazawa (Tokyo) and Dharavi’s Koliwada (Mumbai), the residents where opposing a redevelopment project by the authorities which would have reduced the residents autonomy and threatened the identity of the neighbourhood. In Khirkee we were invited by KHOJ, a leading art collective, in the context of their ongoing community arts initiative. Although KHOJ was already dialoguing and working with residents, it was harder than elsewhere to get residents involved before the workshop started. The Urban Typhoon Khirkee thus focused on establishing relationships and starting projects that Khoj could subsequently continue with the help of some of the workshop’s participants. This seems to have happened in different ways. The fact that KHOJ is an artists collective was particularly significant. Art is central to the workshops. As long as art is defined in a way that includes collective engagements, as long as urban practitioners value the presence of creativity and imagination as fundamentals of living, art is far from incidental. Even in the past, the most successful projects were the one run by artists. We believe that artists often have a very creative way of engaging with the context and people. This is more important than the output. The output will be good if good relationships have been established. Artists and other creative practitioners are essential in an event like Urban Typhoon for these reasons. We look at knowledge as something that encompasses expression, imagination and experience. Knowledge without these is only an abstraction. Subsequently, knowledge exchange happens at ALL levels in these workshops. Of course, there is also knowledge production. The Urban Typhoon produces new ways of looking at familiar places for residents. A new context puts the previous experience of the invited guests in a new perspective and allows them to get deeply immersed in an environment that they may have otherwise overlooked or ignored. They learn about the place and experiment with their practices. The most interesting knowledge creation happens when local residents and guests find a common ground to discuss local issues and understand how they are related to larger issues affecting everyone. When communication channels of this kind are opened and activated knowledge starts flowing both ways and new knowledge is produced through a creative process. In each workshop, a local group’s involvement with the locality is extremely important – especially as they continue to engage with each other in real time and presence. Without the involvement of local groups the workshop becomes superficial. Local groups allow Urban Typhoon to connect with an ongoing history of the neighborhood, local activism or local interventions. It also allows activities and relationships that were started during the Urban Typhoon to continue afterward. This gives great meaning to the event. We were particularly happy to do this with Khoj, because we knew the team would make sure the activities continued and the relationships sustained. The workshops are collaborative. As long as the projects and participants agree on collective authorship, with individuals and groups signing within their acceptable zones of comfort, whatever the arguments, discussions, conflicts and complexities that emerge are never a problem. URBZ sees itself as a hackivists group who aims at understanding the complexities of the system (at the level of a neighbourhood in the case of Urban Typhoon) and plug-in “devices” (events, interventions, projects) that subvert the system and modify the output. This type of intervention draws its social meaning through inclusiveness and crowd-sourcing. It also confronts conflicts creatively. Conflicts are part of the workshop at the levels of process and output. But they are never a hassle. They help generate fresh perspectives as we saw in this workshop too. What remains unsolved are not being able to put processes for follow up on certain projects that had high expectations into place. These include the road and sewage project. In Khirkee it was harder to get local residents involved. And this therefore become the focus of the whole workshop: “how do we engage?” The insider/outsider problematic became larger than necessary mainly because of the doubts and guilt of some of the outsiders who feared that the workshop may become exploitative of the context. Through discussion, we would address this and engage the issues as meaningfully as possible. The larger proportion of artists also helped create a high quality output and presented it in a whole new way. We made it clear that no PowerPoint presentation should be used for the final day presentation and that they would need to take place in the street. This was a great success, which did produce nice connections with passersby and by stimulating many questions and discussions. The workshop tried its best to be multilingual and inclusive. It valued co-creation between guests and local residents the most. Urban Typhoon’s methodology has always been one of inclusiveness, of other approaches and methods as well. Even if a participating team had a strongly top-down approach. This has happened in the past, especially with architects who often find it the hardest to connect with the community. We try not to be ideological about things. But in the end we can clearly see the type of output that has been produced through different approaches and our experience is that in the context of the Urban Typhoon, the teams which have been able to bring together people from different backgrounds and perspectives into common projects are the most innovative and successful ones. At Khirkee, people across disciplines worked together in many projects. We only wish that more local residents would have joined the workshop from the beginning. Fortunately, the workshop came to them and integrated them in many different and creative ways. In terms of follow-up we are very much looking forward to working with Khoj on specific project ideas that the workshop generated. A few participants have continued the work they have started during the workshop with the support of Khoj. All the photos taken during the workshop are available here. The report was compiled and designed by Karin Andersson.